An increasing number of rats in areas of the west of England are mutating to become more resistant to commonly sold poisons, a university study has found. Scientists at Huddersfield University said about 75% of rats in Bristol, Gloucestershire and Wiltshire had built up a resistance. The most serious mutations have affected rats in Bath and Wiltshire. Experts have blamed the rise on the incorrect use of poisons where dosages which are too low have been used. Rats which are resistant to the poison are fattened up by the bait. Those that survive then mate with other resistant rats, allowing a generation of rats resistant to existing poisons to build up. Mutations have previously been found in many parts of the UK but the Huddersfield University study is the first time the extent of resistance has been measured in the West. Dr Dougie Clarke, head of biological sciences at Huddersfield University, said: "Some pest control companies are still using the same rodenticides - Bromadiolone and Difenacoum - in areas where there are resistant rats and things need to change. Meet the enterprising brown rat - one of Bill Oddie's favourite animals. See how humans wage war on unwelcome urban inhabitants such as rats. Get up close and personal with a new species of giant woolly rat. "We're wiping out the normal susceptible rats and we're going to be left with resistant rats only in this area so alternatives have to be found so we're not using these poisons." Fears are also growing over the risk to wildlife and cats which may hunt the rats. Rat catcher Andy Beddows, from Gloucester, said: "If you're putting poison down and it's one of the mutant strain, if it takes a belly full of rodenticide you may as well be giving it Sugar Puffs." He said the poison, which stays inside the rat, could then be passed on to other animals, such as birds of prey and cats, which eat rats. 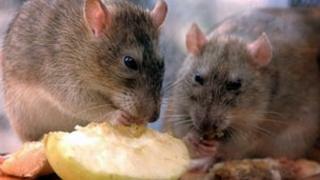 The study aims to survey 25 councils across the country and test samples from 600 rats. So far, about 300 samples have been tested. Although the research is not complete, the scientists said within 10 years all rats in the Gloucestershire, Wiltshire and Bristol areas could be resistant to poisons. Could council budget cuts lead to a rise in vermin?